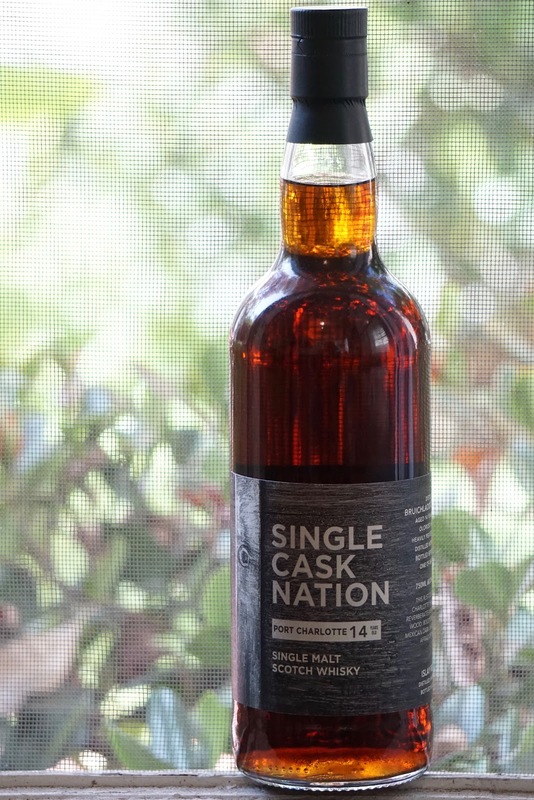 Single Cask Nation Port Charlotte 14yo (60.2%): A very intriguing Port Charlotte release from Single Cask Nation. It is bottled from a first fill Oloroso Hogshead in September 2017 when the whisky was 14 years old at a whopping abv of 60.2%. The whisky is distilled in November 2002 and the cask (#1142) yielded 264 bottles. Color: Now this is a beautiful color with a distinctive red hue... Mahogany and iron rust with thin but incredibly slow legs around the glass. Nose: Dunnage warehouse, rotting wood, ocean breeze and sea salt. Grape molasses, dark Muscovado sugar and beef stew. Grape soda, crystallized ginger and prunes. This is a nose I can spend hours with. Marvelous... Adding water dials down the tartness I enjoyed a lot a notch but adds some funk, pomace brandy aromas and decaying flowers. Palate: They mention Mexican dark chocolate on the label as a tasting note and it is spot on... Spiked and spicy hot chocolate, nutmeg dusting and molasses. It is woody, tart, spicy and sweet... Cumin, garam masala and old wood. It is sweeter and less tart after adding water. Aged rum, maple candies and raisins. Maybe we also just poked the sulphur in it a little. Fortunately it doesn't need that much water. A few drops treats it just well. Finish: Long with melted chocolate, molasses and red pepper. Overall: I am stunned... Hands down this is one of the best Port Charlottes I ever tasted. Stunning whisky... Or maybe it just spoke to me. Or maybe I was in the right mood. Who knows? All I know is that it made me so happy in the middle of the day. At this abv I forgot to add water actually and had to go back later and taste it again. I know that this bottle won't last too long in this household but every drop will be immensely enjoyed and appreciated. Kudos to Single Cask Nation and J&J..!